There’s an interesting bug in the Windows 8.1 code if you upgraded from Windows 8. Chances are, you don’t even know about it until it’s too late. There’s a possibility you may not be able to recover, restore or refresh Windows 8.1 if you upgraded from Windows 8. 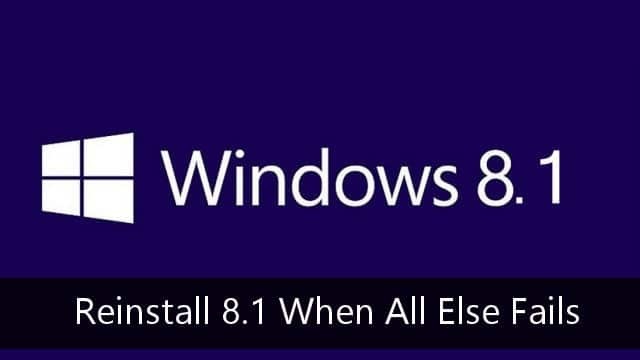 Microsoft has yet to detail when it will release a fix for this but for now, here’s how to reinstall Windows 8.1 if you’re one of the PCs affected. This is the error you’ll see if you try to restore, refresh or recover Windows 8.1 and are affected by this bug. Take a deep breath. Step back and back up your files and folders. The steps you’re going to take shortly are going to bring you back to a fresh Windows 8 install. There’s no way to avoid that at the moment, so you’ll just need to grin and bear it and follow our guide. The issue stems from the fact that Windows 8 users have a Windows 8 license and recovery media. They don’t get a secondary Windows 8.1 license key and recovery media. In fact, during the Windows 8.1 upgrade process, there is no way to create recovery media for Windows 8.1 until the upgrade is finished; there’s also no way to create Windows 8 recovery media after upgrading. So, this puts you in a bind, because if you haven’t already created Windows 8 recovery media, you’re going to have to start with that. The first step to reinstalling Windows 8.1 if you run into this issue is to download the Windows 8 ISO. You can do that with this guide, make sure to create recovery media or use a USB drive to get the job done. Once downloaded, you’ll want to make sure you have backed up all files and folders. The clean installation of Windows 8 will destroy all data on your PC. There’s no way around this, so you must do a backup to keep your files and folders. One of the best suggestions I give all PC owners is to pre-prep a USB drive or even use the cloud to download and store all the programs you’ll re-install after a clean install of Windows 8 or Windows 8.1. This can save time and frustration after performing an install so you can get to using your PC like you did before as quickly as possible. Once you’ve performed the above steps, we can move on to reinstalling Windows 8, then Windows 8.1. When you’re ready to begin the long road to reinstalling Windows 8.1 with this bug, pop in your Windows 8 recovery media and open it up. Go through the steps outlined here to do a clean install of Windows 8. Once you’ve installed Windows 8, now you’ll need to upgrade to Windows 8.1. But… Before you do that, you’ll need to run Windows Update. You see, if you don’t hit a certain threshold with Windows updates in Windows 8, the Windows 8.1 upgrade won’t trigger for your PC. You won’t see it in the Windows Store nor be able to bypass the Windows Store to upgrade. Open up Windows Update on your PC and go through the laboriously task of updating. We won’t lie. This will be the longest part of reinstalling Windows 8.1 when you have no other choice. We recommend doing Windows updates in chunks, five to seven at a time, so that you don’t run into any conflicts or issues during the update process. Once you’ve updated Windows with the available updates, you’ll be ready to upgrade to Windows 8.1. The good news is that since most people have already done this, the download process is quicker than ever so it won’t take nearly as long as it did when Windows 8.1 was released in October 2013. Go through the steps we’ve outlined here to upgrade to Windows 8.1. You’ll set up your PC again with its name, color scheme and customization options, and then you’ll have a brand new clean install of Windows 8.1. From here, you can install your apps, programs and transfer you files and folders back to your PC. You’ll find that your PC will fun faster and be more functional than ever, despite having to go to extraordinary lengths to reinstall Windows 8.1. We never said Microsoft makes anything easy. This bug proves it. When you choose to be on a rapid release cycle, as Microsoft has, these are the types of bugs that can turn consumers away from your OS. By not realizing that some users can’t restore, refresh or recovery Windows 8.1 without starting over – and losing everything in the process – with Windows 8, we can’t even imagine how many consumers have jumped shipped because of this bug. Microsoft continues to amaze its consumer base with issues such as this that should be easy to solve and still aren’t. For now, if you need to restore, recovery or refresh Windows 8.1 after upgrading to Windows 8, at least you know what you’re in store for if you run into this issue. There’s no telling when, or if, Microsoft will fix it or if they’ll simply tie Windows 8/Windows 8.1 licenses in under the same installation scheme. In the meantime, we hope you don’t run into this issue like we did. Even for us, this was too much.